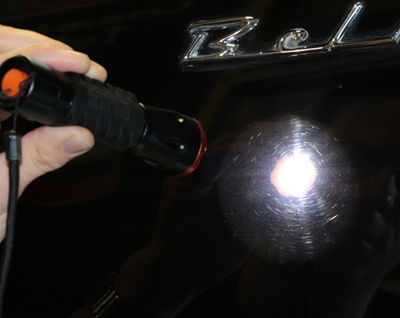 Swirl marks and other gloss-hindering paint defects can no longer hide! Until they are illuminated by a bright light source, they remain in the shadows and rob your paint of gloss. The Flex Swirl Finder Light uses an extremely bright, cool-colored LED bulb which delivers over 010 lumens in an adjustable beam to the paint. The light is so bright that it unveils swirl marks, even in direct sunlight! That's right, the Flex Swirl Finder Light finds the defects that the sun cannot! Traditional halogen spot lambs tend to cast a yellow hue, which works well on black and dark blue colored cars, but has a difficult time on red and orange paints. The Flex Swirl Finder Light features a near pure white LED light for maximum defect visibility on all color paints. What's more, this impressive light features an adjustable focus which allows you to cast a wide spectrum for full panels or a narrow, high-powered beam for spot highlighting. Simply slide the head of the light back and forth to adjust the focus. Made of lightweight and rugged aluminum, with an easy-to-hold grip, the Flex Swirl Finder Light feels very solid in your hands. The solid feel belies the industrial-quality construction. An O-ring gasket provides water resistance; ideal for the detailing environment. The Flex Swirl Finder Light runs on 3 AAA batteries (included) and provides up to 5 hours of run time! The Flex Swirl Finder Light also features three distinct light settings � full power, half power, and strobe. Simply depress the tail-mounted power button to switch between settings. Use the full power setting on light and bright colored vehicles. The half power setting conserves battery life while proving plenty of light for dark colored vehicles. The wrist lanyard allows you to hang the Flex Swirl Finder Light from a light fixture and take advantage of the strobe feature. This provides real time defect removal so you can see the swirl marks disappear under your polisher. Don't trust your results to guess work and poor lighting � illuminate your way to perfect finish with the Flex Swirl Finder Light.